Translation: less Prius, more BMW. Late last year, environmental pundit Amory Lovins explained how incrementalism is now a high-risk strategy. In other words, the environment (which is to say, human life) cannot afford business as usual. We need alternatives to burning gas now. Luckily, we have them. The second generation Prius can easily become a plug-in vehicle; here at LG we’ve converted dozens of Prius to plug-ins and now offer the best plug-in package to date (see earlier post). This is the true 3rd generation Prius. If you already have a second-generation Prius and you’re considering something new, convert it! You will have twice the car as the 2010: a regular Prius and an EV built into one. Arm rests worn out? Tired plastic? LG can solve these problems. The core of the vehicle has tremendous value: Gen 2 Prius will last over 300,000 miles with very few issues. New cars are inevitable and at some point necessary. LG’s business is largely based on them, and I’m not suggesting a John Denver hypocrisy: don’t build a house in the mountains of Colorado (now that I’ve already got one). I’m reminded of Kyoto critics pointing at greenhouse gases from China and India (now that we’ve already loaded the atmosphere with them). 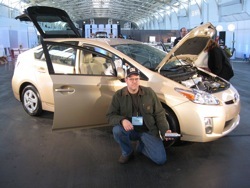 I digress… Clearly we can and will service the 2010 Prius and many new models beyond. But as far as cars and the environment are concerned, we have crossed a threshold. The second generation Prius is perhaps the best car ever made: it’s practical, reliable, fuel efficient, and an ideal platform for a plug-in conversion. 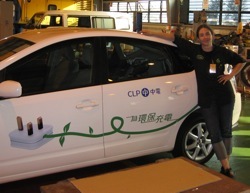 (Pictured: Carolyn with plug-in Prius converted at China Light and Power) With it’s bigger engine and lower EV mode speeds, the 2010 Prius appears less desirable as a plug-in candidate, which to me indicates that the car is slipping back in the internal-combustion direction. We cannot allow this slide to happen. If you are inclined to buy new, I strongly encourage waiting. Toyota can provide plug-in functionality off the assembly line; indeed they recently announced a plug-in version of the latest model at the end of this year. Caveat: only 150 units in the US, only for lease, and only to fleets. Range and performance are unknown. One thing is clear: they won’t make it available to the public unless our collective buying habits encourage them to do so.